Ground turkey meatballs can make a quick and easy dinner! I love ground turkey recipes because ground turkey is often more affordable than ground beef. Ground turkey often has a lower fat content so there is no need to drain off grease, which saves time. It can make easy dinners, like my gluten free korean ground turkey and rice bowl a breeze to make on a rushed weeknight. I often make meatballs using ground turkey. My family can’t tell that my meatballs aren’t beef because they are so flavorful! The ingredients for gluten free turkey meatballs are simple. And they are easy to prep! Just mix the ingredients together in a bowl, scoop the turkey mixture and shape it into balls. I use my 1 ½ tablespoon cookie scoop because it makes shaping the turkey meatballs quick and easy. They come out mostly round, and I just smooth them out a little by gently rolling each meatball between my palms before cooking. Traditionally meatballs have breadcrumbs in them. 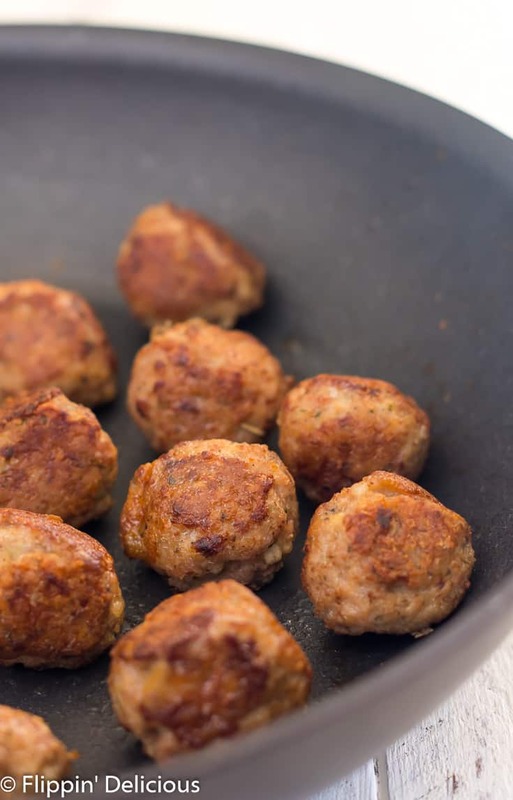 The breadcrumbs, along with milk, eggs, and seasoning, help your meatballs to be tender and juicy. The breadcrumbs can absorb extra fat from the ground meat, which keeps your meatballs juicy. To make gluten free meatballs, simply swap the regular breadcrumbs for a gluten free breadcrumb or substitute. Where do you buy gluten free bread crumbs? I see gluten free breadcrumbs at nearly every store I shop at. Even Walmart has some in stock! If you are planning ahead and find a good deal of breadcrumbs, go ahead and buy some. How do you make gluten free breadcrumbs? You certainly don’t need to buy breadcrumbs, it is super easy to make them. And you don’t have to have gluten free bread! 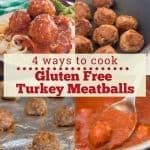 How do you cook gluten free turkey meatballs? How do you cook turkey meatballs on the stove top? I love cooking my turkey meatballs on the stove top because I can get a nice caramelization on all sized. You just don’t get the same browning if you cook them in a pressure cooker, slow cooker, or in the oven. Cooking on a stove top also means I can turn my gluten free turkey meatballs frequently to help them retain their round shape. While I think that cooking turkey meatballs in a skillet on the range gets the best texture and flavor, I usually don’t do it just because I don’t want to/have the time to babysit the pan. If you do have the time, your efforts will be rewarded. Just look at those juicy golden turkey meatballs. 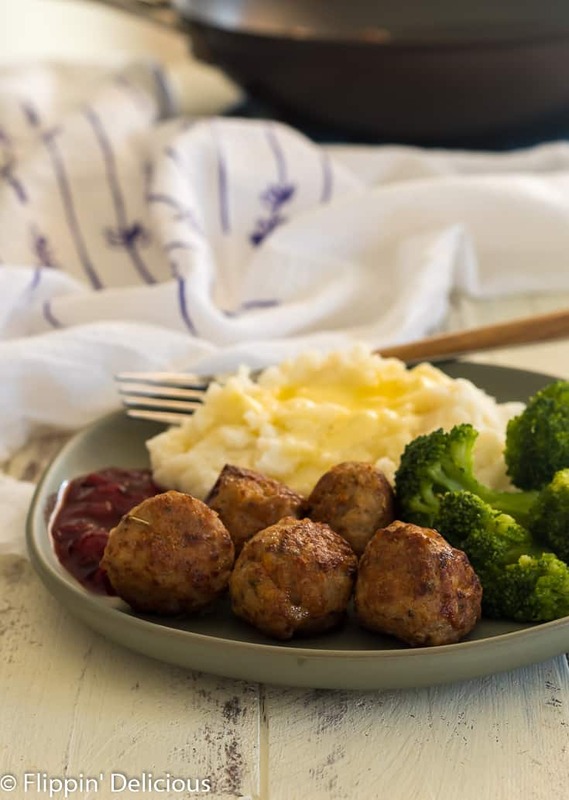 They remind me of the chicken meatballs you can get at Ikea, so I served mine with some cherry filling on the side instead of the lignon berry sauce that Ikea has (just because that is what I have.) So yummy! Heat a skillet (nonstick or cast iron are my favorites) over medium heat and add a little drizzle of oil. I like to use olive oil, but coconut oil, avocado oil, or vegetable oil will work great too. Once your pan is hot, add your turkey meatballs. Keep them rolling around, every 30 seconds or so, to help them brown evenly and retain their roundness. 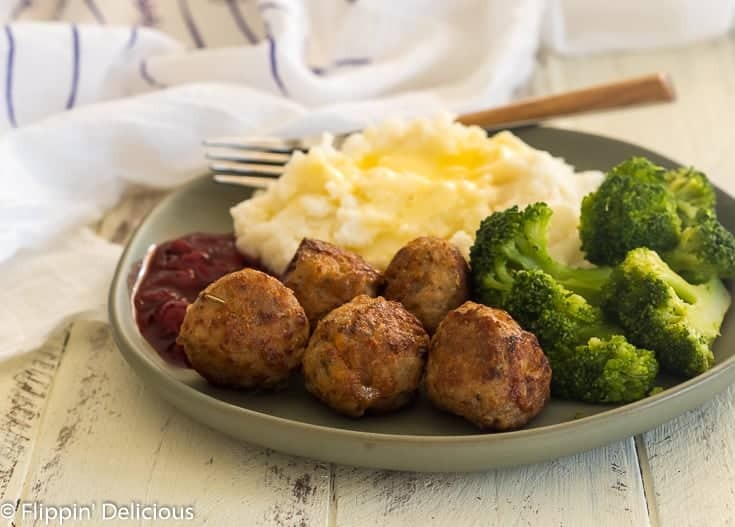 How do you cook turkey meatballs in the oven? 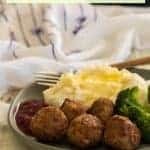 I love baking my turkey meatballs because I don’t have to babysit them, and it is still pretty quick. I often pop them in the oven and then will play with the kids or help them with homework. For easy clean-up, I always line my baking sheet with aluminum foil. A little drizzle of oil will help to keep the turkey meatballs from sticking, and will help them to brown. If you use parchment paper instead, you may not need to use any oil because the parchment paper will prevent them from sticking. To promote even browning, plan to give your turkey meatballs a little flip about half-way through. Preheat your oven to 375°f and line a baking pan with parchment paper or aluminum foil. Place your turkey meatballs on the prepared baking sheet with an inch or so in between (they can be close, just not touching). Bake for 10 minutes, flip, and then bake for another 6-10 minutes or until they are cooked through. They will reach an internal temperature of 165°f and be lightly golden. How do you cook turkey meatballs in a pressure cooker or Instant Pot? My hands-down favorite way to cook turkey meatballs is in my Instant Pot. Why? It is super quick and easy. The meatballs also impart a great flavor to the sauce, and the sauce flavors the turkey meatballs. Clean up is super easy! Also, you can cook frozen-raw meatballs in the same time as you would cook raw meatballs. If I’m making spaghetti, I will pour in one jar of pasta sauce. If I’m making Teriyaki or Barbecue turkey meatballs, I’ll do 1-2 cups of sauce. You need at least one cup for the pressure cooker to come up to pressure properly, and safely. Pour at least one cup of your favorite sauce into your pressure cooker. Add your turkey meatballs to the sauce and set your Instant Pot or electric pressure cooker to manual 10 minutes on high pressure. When finished, release pressure with either the natural or quick release method. 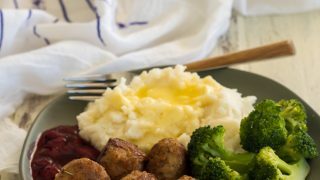 How do you cook turkey meatballs in a slow cooker or crock pot? When I’m on top of things and already prepping my dinner in the morning, my slow cooker is perfect for cooking turkey meatballs. It has all the same flavor pros as using an Instant Pot or pressure cooker. The meat flavors the sauce and the sauce flavors the meat. 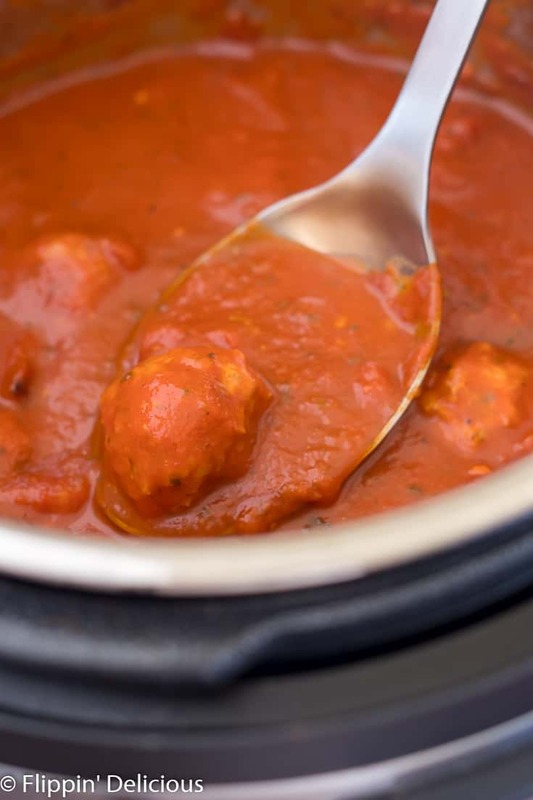 Add your sauce to your slow cooker and set it to HIGH before you mix up your turkey meatball. As you roll your meatballs, you can drop them into the warm sauce. Cook in your slow cooker for X hours on high or X hours on low. How do you freeze gluten free turkey meatballs? Whenever I make gluten free meatballs, I make a double batch. Always! I at least make a double batch, if not a triple batch. Why? Because they freeze incredibly well. 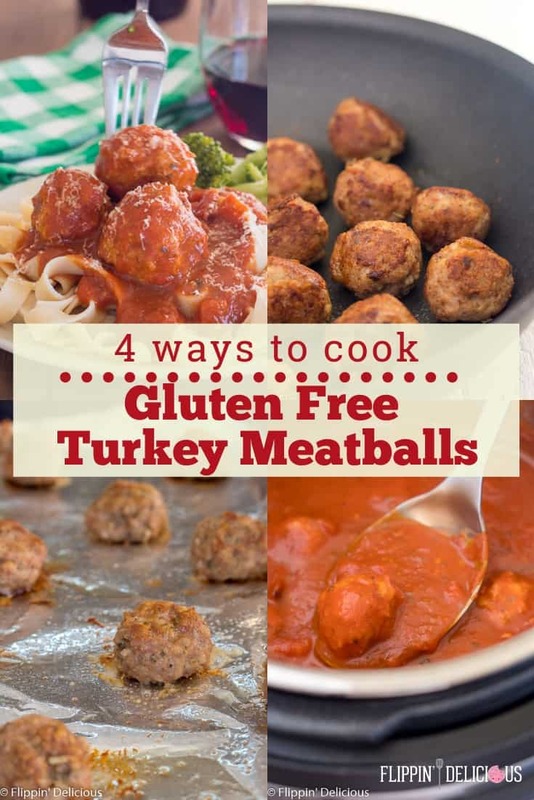 To be honest, I rarely freeze already cooked gluten free turkey meatballs, unless we have leftovers that I know we won’t eat in the next few days. I always freeze my meatballs raw. Scoop the turkey meatball mixture (I use my 1 ½ tablespoon (medium) cookie scoop and gently roll into a ball between the palms of your hands. 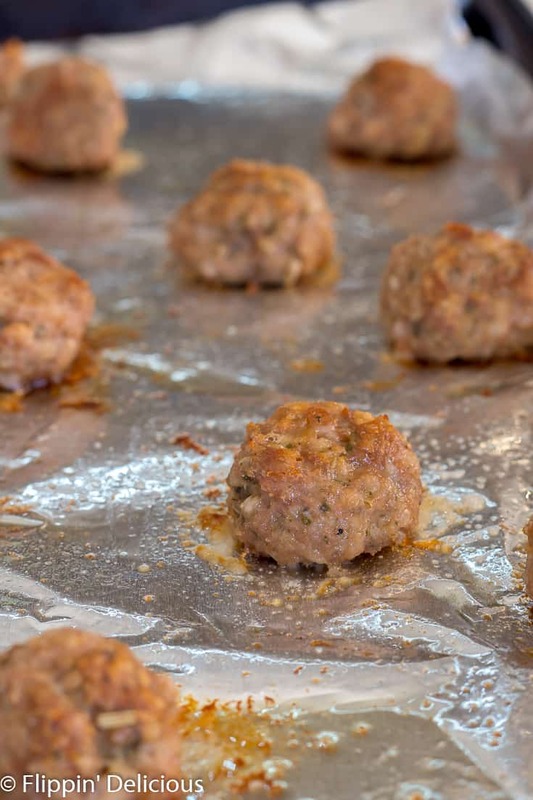 Line the rolled turkey meatballs up inside of a freezer-safe gallon size plastic zipper bag. Carefully squeeze out excess air and then freeze the turkey meatballs on a flat surface. How do you cook raw turkey meatballs from frozen? 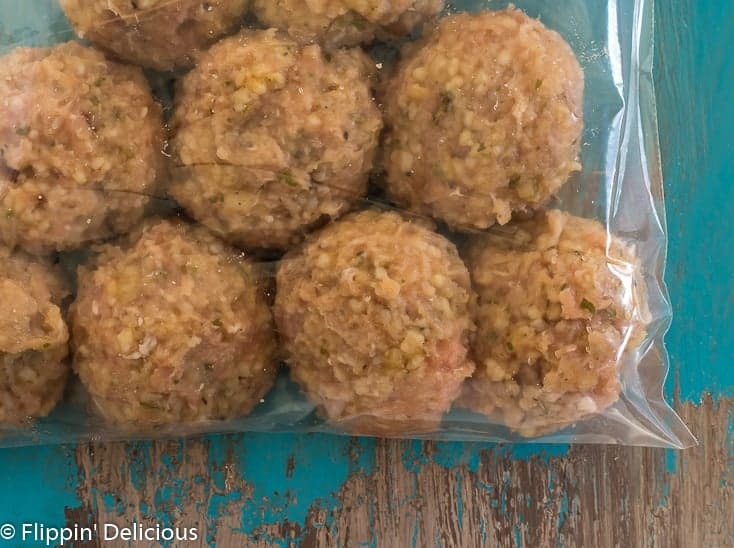 My favorite way to cook my frozen raw turkey meatballs is in my Instant Pot. It doesn’t take any extra time under pressure! I also often bake my frozen raw turkey meatballs. Just add a few extra minutes of cooking time, and you can cook them from frozen! I just pull however many meatballs I need for dinner out the freezer bag, and then save the rest for later. I also will bake frozen turkey meatballs, they just need a few extra minutes of cook time. If you want to cook frozen turkey meatballs on the stove top, I’d recommend thawing them at least partially or they’ll burn on the outside before they are cooked through. I do not recommend cooking frozen meatballs in a slow cooker, for food safety reasons. Adding frozen meatballs for cold sauce, they will not come up to a safe temperature quick enough and bacteria will grow. Ground turkey meatballs can make a quick and easy dinner! 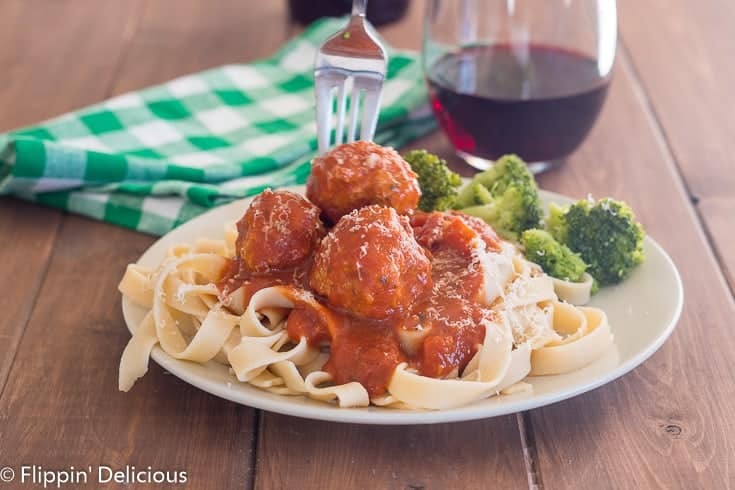 With just a few ingredients, these gluten free turkey meatballs are a staple on our menu! Add all ingredients in a large mixing bowl and gently combine. Scoop into 1 1/2 tablespoon portions using a 1 1/2 tablespoon spring-loaded scoop (or cookie scoop) and gently roll into a ball between the palms of your hands.